Stacy Sammuels [Interstellar Propeller] was part of Nobody's original crew, and with support from many of Nobody's Helpers across the country, did many impromptu Nobody for President songs. 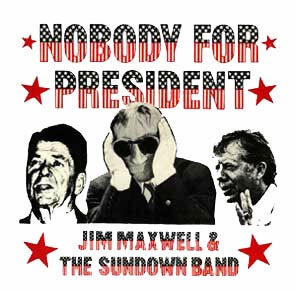 David Peel [Wikipedia] did the first Nobody for President song at Nobody's Rally in Dag Hammarskjold Plaza, New York City, 1976, with support from the Holy Modal Rounders. Uranium Savages [http://www.uraniumsavages.com/] 200801.08 - Apparently I overlooked a note, "Uranium Savages did impromptu Nobody song at end of rally, UofT, Austin, '76." 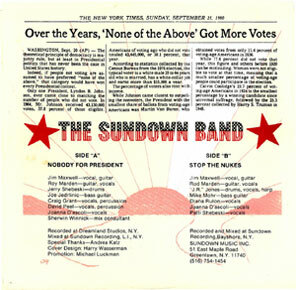 Jim Maxwell - vocal, guitar, Roy Marden - guitar, vocals, Jerry Shebeski - drums, Joe Jedrlinic - bass guitar, Craig Grant - vocals, percussion, David Peel - vocals, percussion, Joanna D'ascoli - vocals, Sherwin Winnick - mix consultant, Recorded at Dreamland Studios, N.Y., Mixed at Sundown Recording, L.I., N.Y., Special Thanks: Andrea Katz, Cover Design: Harry Wasserman, Promotion: Michael Luckman.